eBay Bargains #16 - Disney Edition! Beauty and the Beast Stained Glass Style Vest (£4.58 here) - There's a fine line between looking like you are wearing a child's Disney top and an adult one. But this thankfully is the latter and is just stunning! Very much reminds me of something you would find on Black Milk Clothing but as literally a fraction of the price. Disney Mosaic Phone Case (£4.73 here) - Another mosaic/stain glass style item here that I absolutely love and will purchase sooner rather than later! Just so detailed and vivid. Lots of different size cases in the listing. Beauty and the Beast Stud Earrings (£3.50 here) - In the past I've turned to Gogo Philips and Disney Couture for Disney themed jewellery. But you can find some amazingly cheap pieces on eBay if you look hard enough. Again these are so detailed and not at all childish looking. 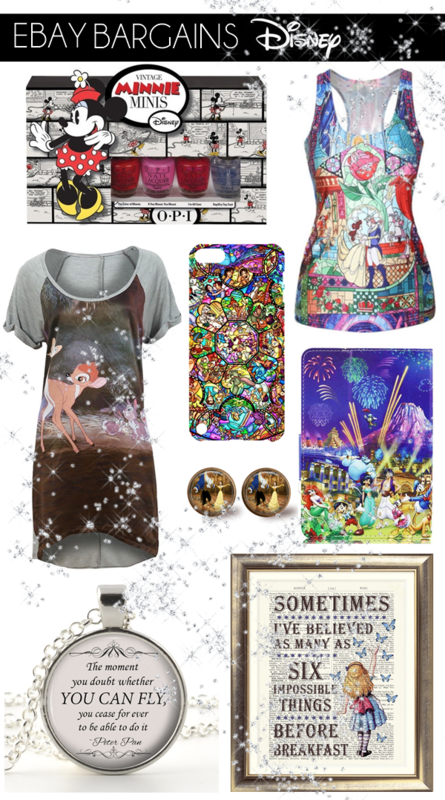 Disney Character Tablet Case (£5.99 here) - Okay, this is a little more cutesy but anything with all the Disney characters on I'm drawn to. The case also acts as a stand and looks pretty well made for the price. Lots of different size cases in the listing. Alice in Wonderland Quote Art Print (£7.50 here) - A lovely one-of-a-kind print here that I just adore. The artist has quite a few different prints - Alice in Wonderland, Peter Pan and Mary Poppins. This would look perfect on a dressing table or gallery style wall. Peter Pan 'You Can Fly' Necklace (£7.99 here) - Totally in love with this! There are a few different quotes in the listing and I really did struggle to just pick one to show as they are all so lovely. I can't help but think this would make a lovely gift to someone that loves Disney. Again not child-like in the slightest. Bambi Nightdress (Size 8-18 - £7.49 here) - Okay, this is my favourite of the lot! Yes, it's a nightie but this could sooo be worn as a dress, right? Give me this over a £390 Givenchy Bambi T-shirt any day of the week! OPI Minnie Minis Nail Polish Set (£9.99 here) - Lastly I had to include something related to beauty and Disney themed - kind of hard to do! I'm a fan of OPI mini sets to start with but this Minni Mouse edition is just adorable! Plus it includes a mini OPI Rapidry Top Coat! I love putting these eBay Bargain posts together but this without a doubt has been my favourite to do!